As a security company we can tell you the best ways to avoid being burgled, the police publish advice and even insurance companies issue their own tips but who better to give you a real insight than a burglar? Leon Reid was a serial burglar, committing over 70 break-ins in London before he was convicted back in 2011. When he was finally arrested he gave the police his own list of the signs he looks for that would make him avoid a property. If the best way to avoid being a victim of crime is to think like a criminal then these tips, straight from the horse’s mouth, really are the ones to take note of. Most of the above measures are actually pretty simple to have in place and a combination of the above would be particularly effective. Don’t forget the obvious things as well like keeping windows shut and doors locked. Apparently, this particular burglar never forced entry into any of the 70 properties he robbed – he simply gained access via windows and doors that were unsecured which is a very telling sign of how complacent many of us are to theft. Don’t wait until you are a victim to act. 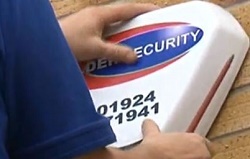 If you would like more details about alarms or CCTV then please don’t hesitate to get in touch.